DYNAGLAS Corrugated Polycarbonate is available for any commercial greenhouse application in multiple tints, including clear, SolarSoft™, white/opal, and solar gray. DYNAGLAS polycarbonate sheets offer all the benefits of polycarbonate glazing, such as high impact resistance, excellent durability, and 99.9% UV blocking. DYNAGLAS Corrugated Polycarbonate PLUS features built-in condensate control that carries a 10-year warranty. You may be thinking about re-covering your greenhouse with DynaGlas Corrugated Polycarbonate Plus but haven’t found a convenient, cost-effective way to do the job. Well, your search is finally over. Palram’s patented DrainAway® Greenhouse Re-Covering System is designed to make the job easy and to keep it within your budget. The DrainAway System is an aluminum System designed to easily and cost-effectively facilitate the recovering of any greenhouse, whether glazed with glass, rigid plastic, or poly film. Whether it was built last year, or last century. Plus, DrainAway equips your greenhouse with a complete condensation collection & removal System. Give us a call and together with your nearest Authorized Dealer we’ll put together a quote and provide detailed drawings for your application. We’ll make you fall in love with that old greenhouse all over again. DynaGlas offers the same sparkling clarity as glass. 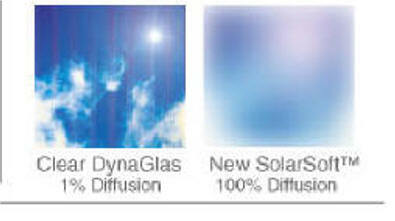 But because DynaGlas requires no shade casting glazing system, DynaGlas transmits as much as 7% more light than glass. DynaGlas Plus SolarSoft 85™ offers high light transmission (85%), but also offers 100% light diffusion, helping to spread light throughout the greenhouse and reduce shadows.